Greetings: here’s some things to do to take your mind off the political world this week. Beginning with a piano: this Wednesday evening, July 31 at 8 pm, Meta House is hosting a piano recital by German pianist Gerd Isselhardt. The programme will include works by the three Bs, Bach, Beethoven and Brahms, along with Fischer-Muenster, Bartok and Prokofieff. Meta House continues the week with two Asian-American directors personally presenting their works: Kalyanee Mam with A River Changes Course on Thursday 1 and Tiana Alexandra with From Hollywood to Hanoi on Friday 2. Both start at 7 pm, will be followed by Q&A, and are free admission events. Meanwhile, in Battambang, a new exhibition opens at Sammaki Gallery (#87, St 2.5) on Friday 2 at 5.30 pm: Global Hybrid featuring women artists from the USA and Cambodia. The exhibition will run until August 16th. The following evening, Saturday 3, Global Hybrid curator Denise A Scott will present a film screening of Humble Beauty, a story of homelessness and art in Los Angeles, at Padma’s (#76, St 2.5), from 7 pm. 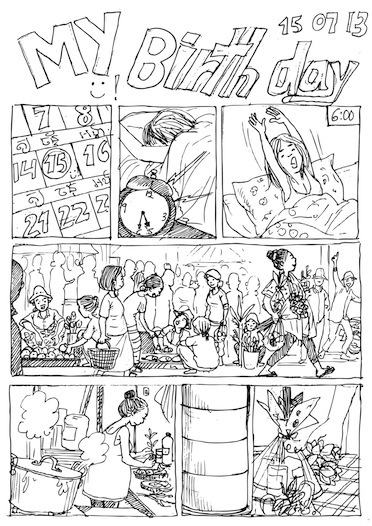 The current Our Books exhibition at Rik Reay gallery (#69c, St 178, near St 19) is by comic artist Chan Pisey. The show opened over the weekend and continues until Sunday August 12. One story, Birthday, was especially created for the event. For a more active activity, on Saturday morning, those with legs and lenses may wish to take part in the latest in an ongoing series of Phnom Penh Photowalks. This walk will focus on an exploration of the Psar Thmei/Central Market area. Meet at True Coffee Shop (cnr Monivong and St 217) at 11 am. As part of the dust-settling around the recent Season of Cambodia in New York, Bophana Center (St 200, between St 63 and Monivong) is hosting a photographic exhibition that documents the activities and participants across the range of visual and performing arts, music and cinema. The exhibition runs until August 8. A brand new initiative has been launched by the Ragamuffin crew, Songkites, a programme to nurture, support and promote Cambodian songwriting. They are seeking applications for young songwriters to take part, spread the word. The Phnom Penh Post’s 7Days magazine has launched a new regular fortnightly feature encouraging the re-imagining of unused corners of Phnom Penh, based on the ideas submitted by readers. Submissions to ppp.lifestyle [ at ] gmail.com. Check the on-going listings below for more details. Make yours a creative week, support an artist near you! Tell your friends about Kumnooh, like us on Facebook, send us things we don’t seem to know. And for rock and roll and clubs, make sure you follow LengPleng.com as well. Piano recital by Gerd Isselhardt, Wednesday 31 at 8 pm at Meta House. More infoKalyanee Mam presents A River Changes Course at Meta House, Thursday 1 at 7 pm. More infoTiana Alexandra presents From Hollywood to Hanoi at Meta House, Friday 2 at 7 pm. Global Hybrid exhibition opens at Sammaki Gallery (#87, St 2.5, Battambang) on Friday 2 at 5.30 pm. Global Hybrid curator Denise A Scott presents Humble Beauty, at Padma’s (#76, St 2.5, Battambang), Saturday 3 from 7 pm. Our Books comic art exhibition at Rik Reay gallery on St 178 by comic artist Chan Pisey. Until Sunday August 12. Season of Cambodia photographic exhibition at Bophana Center until August 8. Phnom Penh Photowalk, visit to Psar Thmei/Central Market, from 11 am. Meet at True Coffee Shop (cnr Monivong and St 217) at 11 am. Kromas, new paintings by Pen Robit, Romeet Gallery. Until August 11th. Continuity, Char Printmaking Workshop, RUFA, opening at The Insider Gallery at InterContinental Phnom Penh. Until August 25th. Homme et nature (Man and Nature) by Nou Sary, at L’Institute francais. Until 31 August. Agua & Achiote: colours of ritual pigments in the Amazon. Photographs by Cybéle Andrei, at Chinese House. Until August 31. Should be lots of fun – all welcome!